Dwight David "Ike" Eisenhower ( /ˈaɪzənhaʊ.ər/ EYE-zən-how-ər; October 14, 1890 – March 28, 1969) was an American army general and statesman who served as the 34th president of the United States from 1953 to 1961. 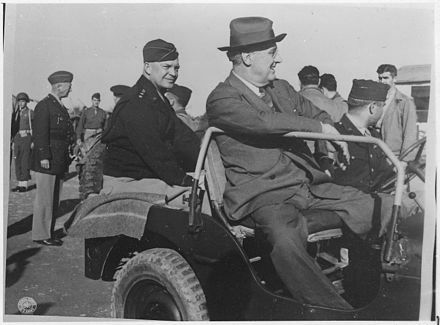 During World War II, he was a five-star general in the United States Army and served as supreme commander of the Allied Expeditionary Forces in Europe. He was responsible for planning and supervising the invasion of North Africa in Operation Torch in 1942–43 and the successful invasion of France and Germany in 1944–45 from the Western Front. General of the Army is a five-star general officer and the second highest possible rank in the United States Army. A General of the Army ranks immediately above a general and is equivalent to a Fleet Admiral and a General of the Air Force. There is no established equivalent five-star rank in the other federal uniformed services. Often called a "five-star general", the rank of General of the Army has historically been reserved for wartime use and is not currently active in the U.S. military. 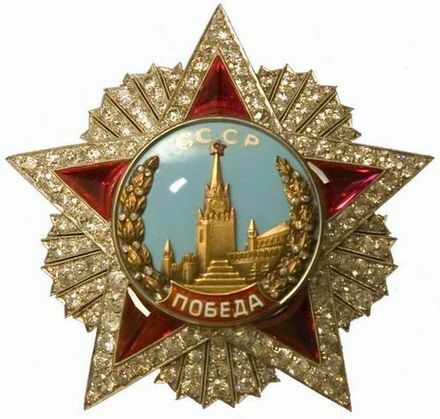 The General of the Army insignia consisted of five 3/8th inch stars in a pentagonal pattern, with points touching. The insignia was paired with the gold and enameled United States Coat of Arms on service coat shoulder loops. The silver colored five-star metal insignia alone would be worn for use as a collar insignia of grade and on the garrison cap. Soft shoulder epaulettes with five 7/16th inch stars in silver thread and gold-threaded United States Coat of Arms on green cloth were worn with shirts and sweaters. Born David Dwight Eisenhowerin Denison, Texas, he was raised in Kansas in a large family of mostly Pennsylvania Dutch ancestry. His family had a strong religious background. His mother was born a Lutheran, married as a River Brethren, and later became a Jehovah's Witness. Even so, Eisenhower did not belong to any organized church until 1952. He cited constant relocation during his military career as one reason. He graduated from West Point in 1915 and later married Mamie Doud, with whom he had two sons. During World War I, he was denied a request to serve in Europe and instead commanded a unit that trained tank crews. Following the war, he served under various generals and was promoted to the rank of brigadier general in 1941. 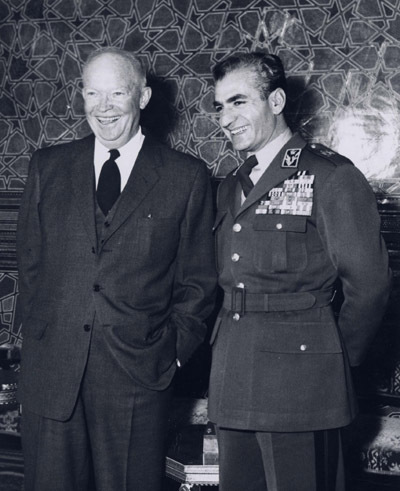 After the U.S. entered World War II, Eisenhower oversaw the invasions of North Africa and Sicily before supervising the invasions of France and Germany. After the war, Eisenhower served as Army Chief of Staff and then took on the role as president of Columbia University. In 1951–52, he served as the first Supreme Commander of NATO. 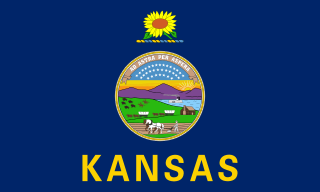 Kansas is a U.S. state in the Midwestern United States. Its capital is Topeka and its largest city is Wichita, with its most populated county being Johnson County. Kansas is bordered by Nebraska on the north; Missouri on the east; Oklahoma on the south; and Colorado on the west. Kansas is named after the Kansas River, which in turn was named after the Kansa Native Americans who lived along it banks. The tribe's name is often said to mean "people of the (south) wind" although this was probably not the term's original meaning. For thousands of years, what is now Kansas was home to numerous and diverse Native American tribes. Tribes in the eastern part of the state generally lived in villages along the river valleys. Tribes in the western part of the state were semi-nomadic and hunted large herds of bison. The Pennsylvania Dutch (Pennsilfaanisch-Deitsche), also referred to as the Pennsylvania Germans, are a cultural group formed by early German-speaking immigrants to Pennsylvania and their descendants. The word "Dutch" does not refer to the Dutch people or Dutch language, but to the German settlers, known as Deutsch and Deitsch. 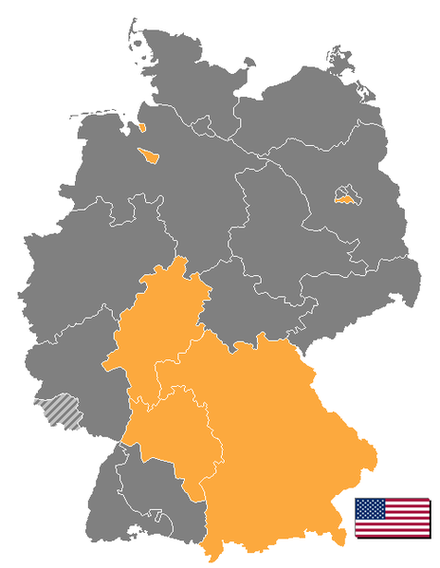 Most emigrated, in the 17th and 18th centuries, to the Americas from within the Holy Roman Empire, which included areas that were later to become Germany and Switzerland. Over time, the various dialects spoken by these immigrants fused into a unique dialect of German known as Pennsylvania German or Pennsylvania "Dutch". The Republican Party, also referred to as the GOP, is one of the world's oldest extant political parties. The party values reflect economic conservatism, classical conservatism and corporate liberty rights. It is the second oldest existing political party in the United States after its primary rival, the Democratic Party. The party emerged in 1854 to combat the Kansas–Nebraska Act, an act that dissolved the terms of the Missouri Compromise and allowed slave or free status to be decided in the territories by popular sovereignty. The early Republican Party had almost no presence in the Southern United States, but by 1858 it had enlisted former Whigs and former Free Soil Democrats to form majorities in nearly every Northern state. Robert Alphonso Taft Sr. was an American conservative politician, lawyer, and scion of the Republican Party's Taft family. Taft represented Ohio in the United States Senate, briefly served as Senate Majority Leader, and was a leader of the conservative coalition of Republicans and conservative Democrats who prevented expansion of the New Deal. Often referred to as "Mr. Republican," he cosponsored the Taft–Hartley Act of 1947, which banned closed shops and other labor practices. 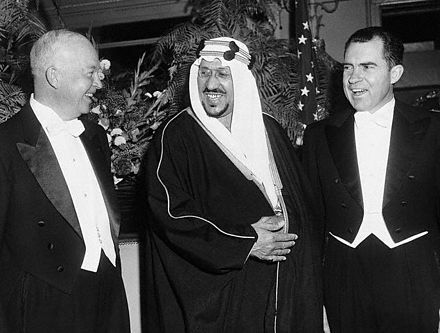 Adlai Ewing Stevenson II was an American lawyer, politician, and diplomat. 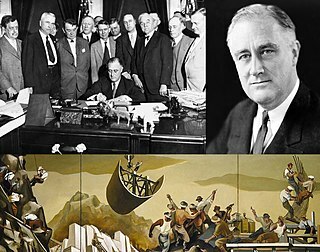 The Rockefeller Republicans, also called Moderate or Liberal Republicans, were members of the Republican Party (GOP) in the 1930s–1970s who held moderate to liberal views on domestic issues, similar to those of Nelson Rockefeller, Governor of New York (1959–1973) and Vice President of the United States (1974–1977). Rockefeller Republicanism has been described as the last phase of the "Eastern Establishment" of the GOP which had been led by New York governor Thomas E. Dewey. The group's powerful role in the GOP came under heavy attack in 1964 and it lost most of its influence. At a discouraging point in the 1964 primary campaign against Barry Goldwater in California, political operative Stuart Spencer called on Rockefeller to "summon that fabled nexus of money, influence, and condescension known as the Eastern Establishment." Rockefeller replied, "You are looking at it, buddy, I am all that is left". Karlsbrunn is a German village, part of the municipality of Großrosseln, situated in the district of Saarbrücken, part of the federal state of Saarland. Its population is about 1,100 inhabitants. York, known as the White Rose City, is the county seat of York County, Pennsylvania, United States, located in the south-central region of the state. The population within York's city limits was 43,718 at the 2010 census, a 7.0% increase from the 2000 count of 40,862. When combined with the adjacent boroughs of West York and North York and surrounding Spring Garden, West Manchester, and Springettsbury townships, the population of Greater York was 108,386. York is the 11th largest city in Pennsylvania. Lancaster is a city located in South Central Pennsylvania which serves as the seat of Pennsylvania's Lancaster County and one of the oldest inland towns in the United States. With a population of 59,322, it ranks eighth in population among Pennsylvania's cities. The Lancaster metropolitan area population is 507,766, making it the 101st largest metropolitan area in the U.S. and second largest in the South Central Pennsylvania area. 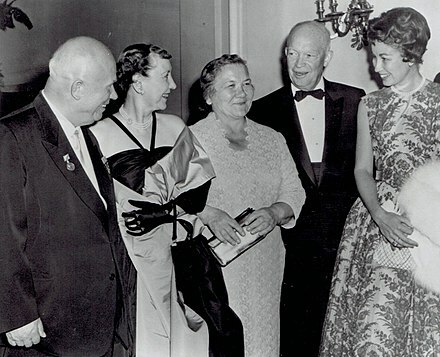 Ida Elizabeth Stover Eisenhower was the mother of U.S. President Dwight David Eisenhower (1890–1969), university president Milton Stover Eisenhower (1899–1985), Edgar N. Eisenhower (1889–1971), and Earl D. Eisenhower (1898–1968). Lecompton is a city in Douglas County, Kansas, United States. As of the 2010 census, the city population was 625. Lane University was a college located in Lecompton, Kansas. It was founded in 1865 by Rev. Solomon Weaver, the first president, and was named after U.S. Senator James H. Lane. Jim Lane was a main free-state leader, and Lecompton was previously the capital of the opposing pro-slavery faction. Local tradition notes that a funding drive to construct the university promised to name it after the major contributor. Allegedly, James H. Lane made the largest pledge, received the namesake honor, and then died of a self-inflicted gunshot wound before he could carry out his promise. 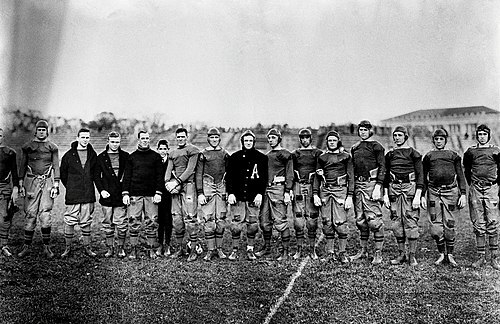 Eisenhower later served as junior varsity football coach and cheerleader. He graduated in the middle of the class of 1915,  which became known as "the class the stars fell on", because 59 members eventually became general officers. The Eisenhowers had two sons. Doud Dwight "Icky" Eisenhower (1917–1921) died of scarlet fever at the age of three. Eisenhower was mostly reticent to discuss his death. 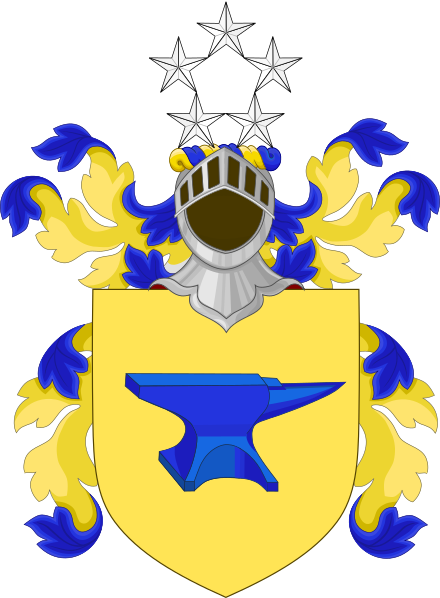 Their second son, John Eisenhower (1922–2013), was born in Denver, Colorado. John served in the United States Army, retired as a brigadier general, became an author and served as U.S. Ambassador to Belgium from 1969 to 1971. Coincidentally, John graduated from West Point on D-Day, June 6, 1944. He married Barbara Jean Thompson on June 10, 1947. John and Barbara had four children: David, Barbara Ann, Susan Elaine and Mary Jean. David, after whom Camp David is named,  married Richard Nixon's daughter Julie in 1968. After graduation in 1915, Second Lieutenant Eisenhower requested an assignment in the Philippines, which was denied. He served initially in logistics and then the infantry at various camps in Texas and Georgia until 1918. In 1916, while stationed at Fort Sam Houston, Eisenhower was football coach for St. Louis College, now St. Mary's University. 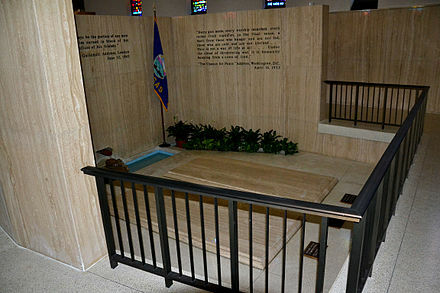 Eisenhower was an honorary member of the Sigma Beta Chi fraternity at St. Mary's University. In late 1917, while he was in charge of training at Ft. Oglethorpe in Georgia, his wife Mamie had their first son. From 1920, Eisenhower served under a succession of talented generals – Fox Conner, John J. Pershing, Douglas MacArthur and George Marshall. He first became executive officer to General Conner in the Panama Canal Zone, where, joined by Mamie, he served until 1924. Under Conner's tutelage, he studied military history and theory (including Carl von Clausewitz's On War ), and later cited Conner's enormous influence on his military thinking, saying in 1962 that "Fox Conner was the ablest man I ever knew." 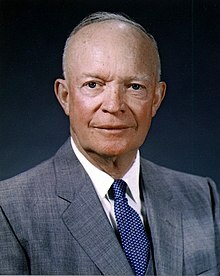 Conner's comment on Eisenhower was, "[He] is one of the most capable, efficient and loyal officers I have ever met." 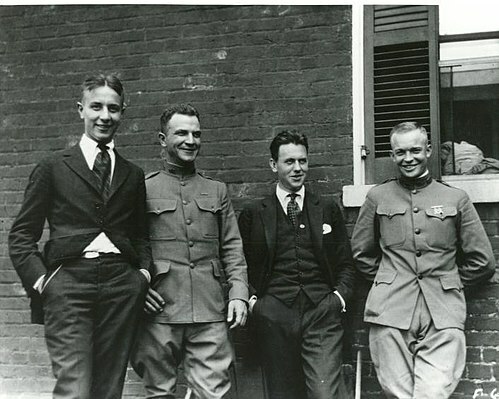 On Conner's recommendation, in 1925–26 he attended the Command and General Staff College at Fort Leavenworth, Kansas, where he graduated first in a class of 245 officers. He then served as a battalion commander at Fort Benning, Georgia, until 1927. 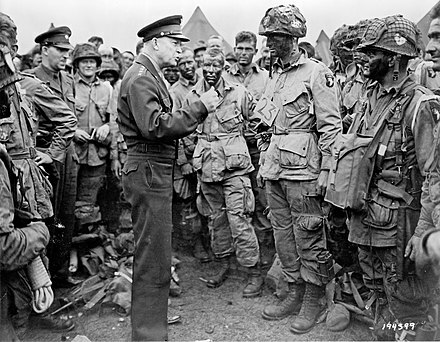 Eisenhower returned to the United States in December 1939 and was assigned as commanding officer (CO) of the 1st Battalion, 15th Infantry Regiment at Fort Lewis, Washington, later becoming the regimental executive officer. In March 1941 he was promoted to colonel and assigned as chief of staff of the newly activated IX Corps under Major General Kenyon Joyce. In June 1941, he was appointed chief of staff to General Walter Krueger, Commander of the Third Army, at Fort Sam Houston in San Antonio, Texas. After successfully participating in the Louisiana Maneuvers, he was promoted to brigadier general on October 3, 1941. Although his administrative abilities had been noticed, on the eve of the American entry into World War II he had never held an active command above a battalion and was far from being considered by many as a potential commander of major operations. 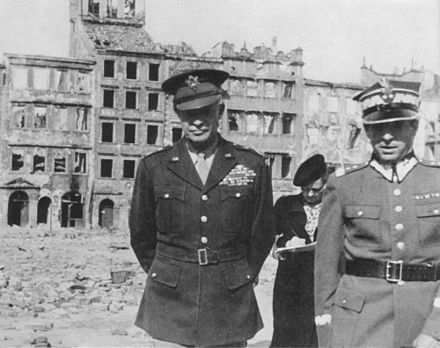 At the end of May 1942, Eisenhower accompanied Lt. Gen. Henry H. Arnold, commanding general of the Army Air Forces, to London to assess the effectiveness of the theater commander in England, Maj. Gen. James E. Chaney. He returned to Washington on June 3 with a pessimistic assessment, stating he had an "uneasy feeling" about Chaney and his staff. On June 23, 1942, he returned to London as Commanding General, European Theater of Operations (ETOUSA), based in London and with a house on Coombe, Kingston upon Thames,  and took over command of ETOUSA from Chaney. He was promoted to lieutenant general on July 7. Operation Torch also served as a valuable training ground for Eisenhower's combat command skills; during the initial phase of Generalfeldmarschall Erwin Rommel's move into the Kasserine Pass, Eisenhower created some confusion in the ranks by some interference with the execution of battle plans by his subordinates. He also was initially indecisive in his removal of Lloyd Fredendall, commanding U.S. II Corps. He became more adroit in such matters in later campaigns. In February 1943, his authority was extended as commander of AFHQ across the Mediterranean basin to include the British Eighth Army, commanded by General Sir Bernard Montgomery. The Eighth Army had advanced across the Western Desert from the east and was ready for the start of the Tunisia Campaign. Eisenhower gained his fourth star and gave up command of ETOUSA to become commander of NATOUSA. 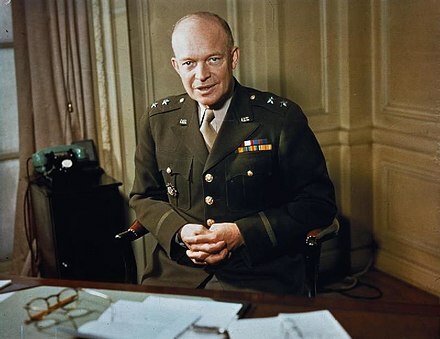 In December 1943, President Roosevelt decided that Eisenhower – not Marshall – would be Supreme Allied Commander in Europe. The following month, he resumed command of ETOUSA and the following month was officially designated as the Supreme Allied Commander of the Allied Expeditionary Force (SHAEF), serving in a dual role until the end of hostilities in Europe in May 1945. He was charged in these positions with planning and carrying out the Allied assault on the coast of Normandy in June 1944 under the code name Operation Overlord, the liberation of Western Europe and the invasion of Germany. Two controversies during the campaign tested him and his staff, but did not affect the campaign. 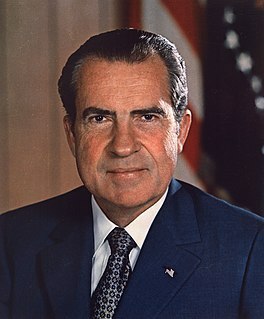 One involved a report that Nixon had improperly received funds from a secret trust. Nixon spoke out adroitly to avoid potential damage, but the matter permanently alienated the two candidates. The second issue centered on Eisenhower's relented decision to confront the controversial methods of Joseph McCarthy on his home turf in a Wisconsin appearance. 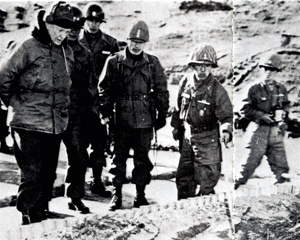 Just two weeks prior to the election, Eisenhower vowed to go to Korea and end the war there. He promised to maintain a strong commitment against Communism while avoiding the topic of NATO; finally, he stressed a corruption-free, frugal administration at home. Eisenhower was assured of an enduring achievement when he championed and signed the bill that authorized the Interstate Highway System in 1956. He justified the project through the Federal Aid Highway Act of 1956 as essential to American security during the Cold War. It was believed that large cities would be targets in a possible war, hence the highways were designed to facilitate their evacuation and ease military maneuvers. Eisenhower and the CIA had known since at least January 1957, nine months before Sputnik, that Russia had the capability to launch a small payload into orbit and was likely to do so within a year. He may also privately have welcomed the Russian satellite for its legal implications: By launching a satellite, Russia had in effect acknowledged that space was open to anyone who could access it, without needing permission from other nations. Whittaker was unsuited for the role and soon retired. Stewart and Harlan were conservative Republicans, while Brennan was a Democrat who became a leading voice for liberalism. In selecting a Chief Justice, Eisenhower looked for an experienced jurist who could appeal to liberals in the party as well as law-and-order conservatives, noting privately that Warren "represents the kind of political, economic, and social thinking that I believe we need on the Supreme Court ... He has a national name for integrity, uprightness, and courage that, again, I believe we need on the Court". In the next few years Warren led the Court in a series of liberal decisions that revolutionized the role of the Court. Following the presidency, Eisenhower moved to the place where he and Mamie had spent much of their post-war time. The home was a working farm adjacent to the battlefield at Gettysburg, Pennsylvania, 70 miles from his ancestral home in Elizabethville, Dauphin County, Pennsylvania. They also maintained a retirement home in Palm Desert, California. In 1967 the Eisenhowers donated the Gettysburg farm to the National Park Service. 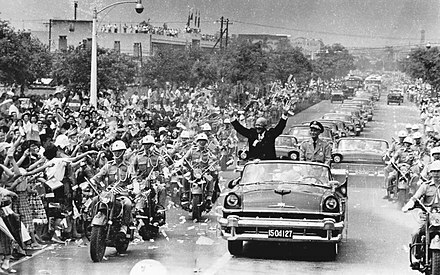 Eisenhower's reputation declined in the immediate years after he left office. During his presidency, he was widely seen by critics as an inactive, uninspiring, golf-playing president. This was in stark contrast to his vigorous young successor, John F. Kennedy, who was 26 years his junior. 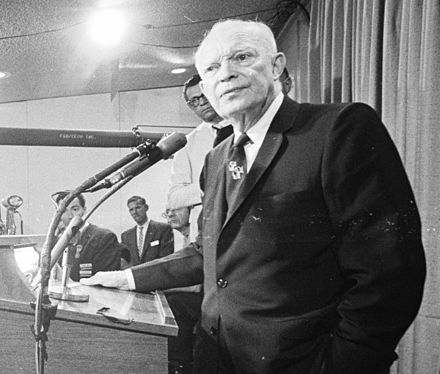 Despite his unprecedented use of Army troops to enforce a federal desegregation order at Central High School in Little Rock, Eisenhower was criticized for his reluctance to support the civil rights movement to the degree that activists wanted. 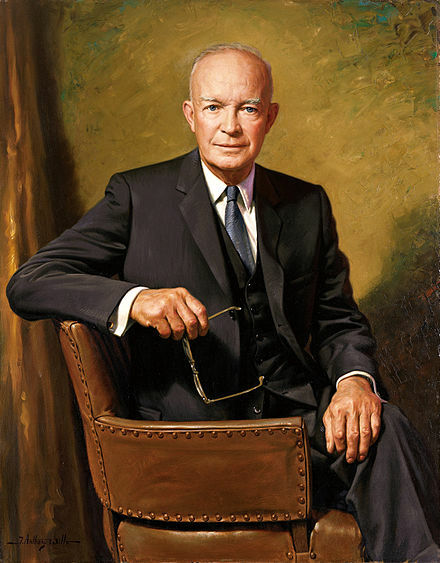 Eisenhower also attracted criticism for his handling of the 1960 U-2 incident and the associated international embarrassment,   for the Soviet Union's perceived leadership in the nuclear arms race and the Space Race, and for his failure to publicly oppose McCarthyism. Since the 19th century, many if not all presidents were assisted by a central figure or "gatekeeper", sometimes described as the president's private secretary, sometimes with no official title at all. 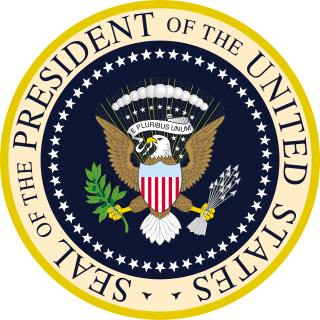 Eisenhower formalized this role, introducing the office of White House Chief of Staff – an idea he borrowed from the United States Army. Every president after Lyndon Johnson has also appointed staff to this position. Initially, Gerald Ford and Jimmy Carter tried to operate without a chief of staff, but each eventually appointed one. 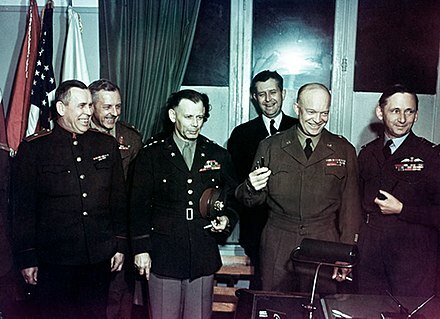 On December 20, 1944, Eisenhower was appointed to the rank of General of the Army, placing him in the company of George Marshall, Henry "Hap" Arnold, and Douglas MacArthur, the only four men to achieve the rank in World War II. Along with Omar Bradley, they were the only five men to achieve the rank since the August 5, 1888 death of Philip Sheridan, and the only five men to hold the rank as a Five-star general. The rank was created by an Act of Congress on a temporary basis, when Public Law 78-482 was passed on December 14, 1944,  as a temporary rank, subject to reversion to permanent rank six months after the end of the war. The temporary rank was then declared permanent on March 23, 1946 by Public Law 333 of the 79th Congress, which also awarded full pay and allowances in the grade to those on the retired list. It was created to give the most senior American commanders parity of rank with their British counterparts holding the ranks of field marshal and admiral of the fleet. This second General of the Army rank is not the same as the post-Civil War era version because of its purpose and five stars. 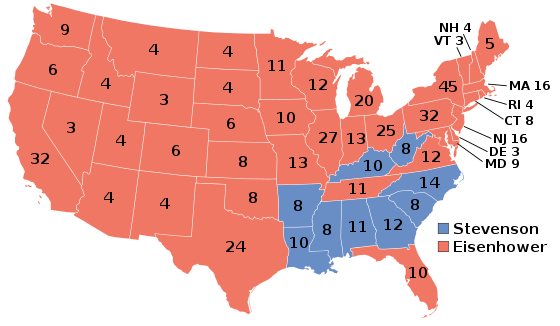 The 1952 United States presidential election was the 42nd quadrennial presidential election. It was held on Tuesday, November 4, 1952. Republican Dwight D. Eisenhower won a landslide victory over Democrat Adlai Stevenson, ending a string of Democratic Party wins that stretched back to 1932. Stephen Edward Ambrose was an American historian and biographer of U.S. Presidents Dwight D. Eisenhower and Richard Nixon. He was a longtime professor of history at the University of New Orleans and the author of many bestselling volumes of American popular history. William Fife Knowland was an American politician, newspaper publisher, and Republican Party leader. He was a US Senator representing California from 1945 to 1959. 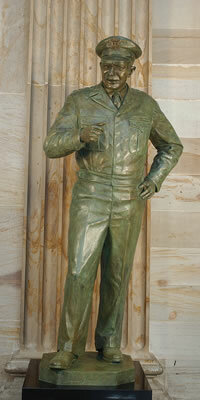 He served as Senate Majority Leader from August 1953 to January 1955 after the death of Robert A. Taft. 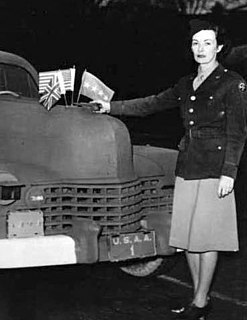 Kathleen Helen Summersby BEM, known as Kay Summersby, was a member of the British Mechanised Transport Corps during World War II, who served as a chauffeur and later as personal secretary to Dwight D. Eisenhower during his period as Supreme Commander Allied Expeditionary Force in command of the Allied forces in north west Europe. They were together a great deal until the war ended, when Eisenhower cut ties and returned to the United States. 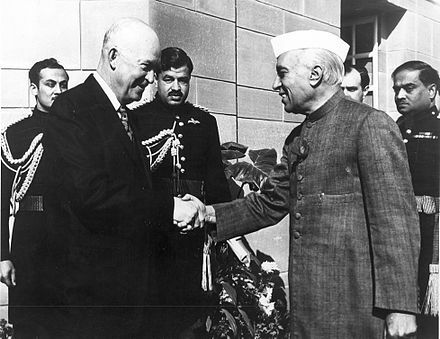 It is generally agreed that Summersby and Eisenhower became extremely close during the war, and some writers have suggested that they had a sexual relationship, although people who knew both of them at the time have rejected that claim, as have most of Eisenhower's biographers. John Sheldon Doud Eisenhower was a United States Army officer, diplomat, and military historian. The son of President Dwight D. Eisenhower, his decorated military career spanned from before, during, and after his father's presidency, and he would retire from active duty in 1963 and then altogether in 1974. From 1969 to 1971, he served as United States Ambassador to Belgium during the administration of President Richard Nixon, previously his father's Vice President. The 1952 Republican National Convention was held at the International Amphitheatre in Chicago, Cook County, Illinois from July 7 to 11, 1952, and nominated the popular general and war hero Dwight D. Eisenhower of Kansas, nicknamed "Ike," for president and the anti-communist crusading Senator from California, Richard M. Nixon, for vice president. Dwight David Eisenhower II is an American author, public policy fellow, professor at the University of Pennsylvania, and eponym of the U.S. Presidential retreat, Camp David. He is the only grandson of the 34th President of the United States, Dwight D. Eisenhower, and the son-in-law of the 37th President of the United States, Richard Nixon. Alfred Maximilian Gruenther was a senior United States Army officer, Red Cross president, and bridge player. At age fifty-three, he became the youngest four-star general in the U.S. Army's history. He succeeded General Matthew Ridgway as the Supreme Allied Commander (SACEUR) in Europe serving from 1953 to 1956. Eisenhower National Historic Site preserves the home and farm of Dwight D. Eisenhower, the 34th President of the United States, and its surrounding property of 690.5 acres (279.4 ha). It is located in Cumberland Township, Adams County, Pennsylvania, just outside Gettysburg. Purchased by then-General Eisenhower and his wife Mamie in 1950, the farm served as a weekend retreat for the President and a meeting place for world leaders, and became the Eisenhowers' home after they left the White House in 1961. 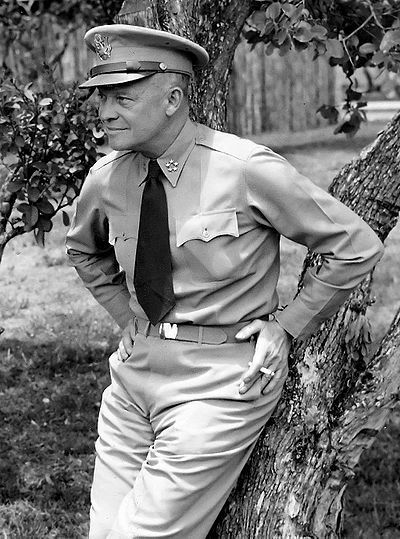 The military career of Dwight D. Eisenhower encompassed over forty six years of active service. Partisan is a committed member of a political party or army. In multi-party systems, the term is used for politicians who strongly support their party's policies and are reluctant to compromise with their political opponents. A political partisan is not to be confused with a military partisan.. The presidency of Dwight D. Eisenhower began on January 20, 1953, when he was inaugurated as the 34th President of the United States, and ended on January 20, 1961. Eisenhower, a Republican, took office as president following a landslide win over Democrat Adlai Stevenson in the 1952 presidential election. This victory upended the New Deal Coalition that had kept the presidency in the hands of the Democratic Party for 20 years. Four years later, in the 1956 presidential election, he defeated Stevenson in a landslide again, winning a second term in office. He was succeeded in office by Democrat John F. Kennedy after the 1960 election. The 1952 Republican presidential primaries were the selection process by which voters of the Republican Party chose its nominee for President of the United States in the 1952 U.S. presidential election. Former U.S. Army General Dwight D. Eisenhower was selected as the nominee through a series of primary elections and caucuses culminating in the 1952 Republican National Convention held from July 7 to July 11, 1952, in Chicago, Illinois. The 1956 United States presidential election in New Hampshire took place on November 6, 1956, as part of the 1956 United States presidential election, which was held throughout all contemporary 48 states. Voters chose 4 representatives, or electors to the Electoral College, who voted for president and vice president. The 1952 United States presidential election in New Hampshire took place on November 4, 1952, as part of the 1952 United States presidential election, which was held throughout all contemporary 48 states. Voters chose 4 representatives, or electors to the Electoral College, who voted for president and vice president. This article lists those who were potential candidates for the Republican nomination for Vice President of the United States in the 1952 election. After defeating Ohio Senator Robert A. Taft for the Republican presidential nomination at the 1952 Republican National Convention, General Dwight D. Eisenhower needed to choose a running mate. Taft recommended Illinois Senator Everett Dirksen, but Eisenhower rejected the suggestion. Eisenhower and his advisers put together a list of prominent Republicans who were acceptable to both the conservative Taft and liberal Dewey wings of the party, anti-Communist, talented at campaigning, relatively young, and who contributed to Eisenhower's nomination victory. After conferring with Republican Party leaders, Eisenhower decided to ask California Senator Richard Nixon to be his running mate; Nixon accepted the offer. 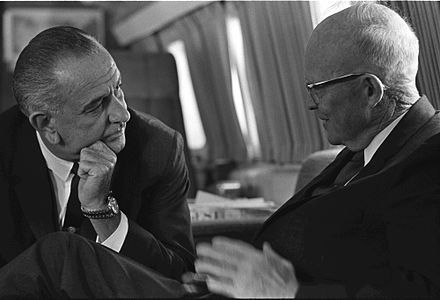 Nixon had carefully campaigned for the post of vice president since meeting Eisenhower in 1951, and Nixon helped deliver the California delegation to Eisenhower in the presidential ballot. 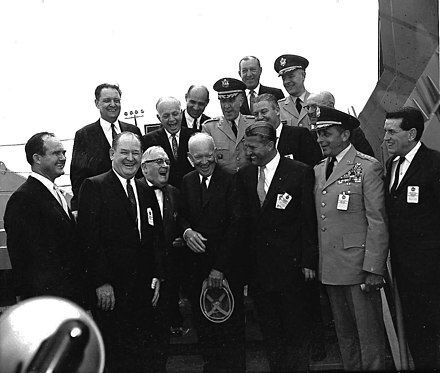 The Republican convention ratified Eisenhower's choice of Nixon. Months after the convention, Eisenhower considered asking Nixon to step down as running mate due to controversy surrounding campaign expenses, but Nixon rallied public opinion with his Checkers speech and remained on the ticket. The Eisenhower-Nixon ticket won the 1952 election, as well as the 1956 election, defeating the Stevenson-Sparkman and Stevenson-Kefauver tickets, respectively. This bibliography of Dwight D. Eisenhower is a list of published works about Dwight D. Eisenhower, 34th President of the United States. ↑ "Public School Products". Time . September 14, 1959. ↑ "Eisenhower: Soldier of Peace". Time . April 4, 1969. Retrieved May 23, 2008. ↑ "Dwight David Eisenhower". Internet Public Library . Retrieved May 23, 2008. ↑ Richard F. Weingroff (March – April 2003). "The Man Who Changed America, Part I". fhwa.dot.gov. ↑ American President: An Online Reference Resource, Dwight David Eisenhower (1890–1969), "Life Before the Presidency," Archived June 5, 2011, at the Wayback Machine Miller Center of Public Affairs, University of Virginia. ↑ Wukovits, John F. (2006). Eisenhower. New York: Palgrave Macmillan. p. 43. ISBN 978-0-230-61394-2 . Retrieved June 15, 2011. ↑ D'Este, Carlo (2002). Eisenhower: A Soldier's Life. New York: Henry Holt & Co. p. 223. ISBN 0-8050-5687-4 . Retrieved June 15, 2011. ↑ Huston, John W. (2002). Maj. Gen. John W. Huston, USAF (ed.). American Airpower Comes of Age: General Henry H. "Hap" Arnold's World War II Diaries. Air University Press. pp. 288, 312. ISBN 1585660930. 1 2 3 4 Gibbs, Nancy (November 10, 2008). "When New President Meets Old, It's Not Always Pretty". Time . ↑ Frum, David (2000). How We Got Here: The 70s The Decade That Brought You Modern Life – For Better Or Worse. New York, New York: Basic Books. p. 7. ISBN 0-465-04196-5. ↑ Crockett, Zachary (January 23, 2017). "Donald Trump is the only US president ever with no political or military experience". vox.com. Retrieved January 8, 2019. 1 2 "Interstate Highway System". Eisenhower Presidential Center . Retrieved August 21, 2012. ↑ Accinelli, Robert (1990). "Eisenhower, Congress, and the 1954–55 offshore island crisis". Presidential Studies Quarterly. 20 (2): 329–48. doi:10.2307/27550618 (inactive May 30, 2018). JSTOR 27550618. ↑ "Former Presidents Act". National Archives and Records Administration . Retrieved May 23, 2008. ↑ Klaus, Mary (August 8, 1985). "Tiny Pennsylvania Town An Escape From Modernity". Sun-Sentinel . Retrieved January 4, 2016. From this farm the family migrated to Kansas in the summer of 1878. ↑ Goldschlag, William (May 11, 2016). "When an ex-president helped an 'extreme' Republican candidate". Newsday . Retrieved December 9, 2016. 1 2 "Dwight D. Eisenhower – Final Post". Eisenhower Presidential Center . Retrieved August 21, 2012. 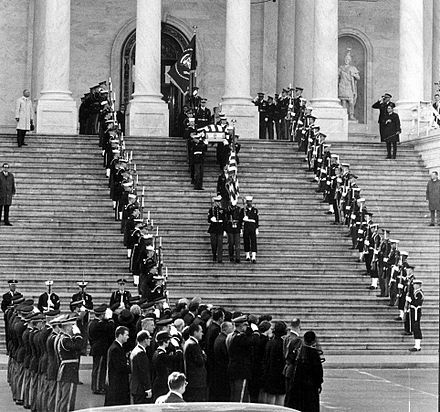 ↑ "A Simple Funeral Honors Ike". The Desert Sun . UPI. April 1, 1969. Retrieved April 16, 2019. ↑ "Presidential Politics". Public Broadcasting Service . Retrieved May 23, 2008. ↑ "Public Law 482" . Retrieved April 29, 2008. This law allowed only 75% of pay and allowances to the grade for those on the retired list. ↑ Plumb, Tiereny (January 22, 2010). "Gilbane to manage design and construction of Eisenhower Memorial". Washington Business Journal . American City Business Journals, Inc.
↑ "Eisenhower to Get Honor; City of London to Give Limited Freedom and Sword". The New York Times. June 9, 1945. Retrieved June 25, 2016.